June is a delightful month in Bahia, there are many saint holidays, popular parties and celebrations (including São João and Brazilian Valentine's Day). The weather is cooler with intermittent rain storms, which is a relief after months and months of heat, sun and humidity. In the candomblé community, June is the month of public parties, as terreiros host open events in celebration of specific gods (orixás), which sometimes align with Christain saint's holidays. In service of my research, I have been attending these "parties", and opening up a new phase in my research experience. In the past three weeks I've been to 3 parties at different terreiros -- Gantois, Casa Branca and Casa Oxumarê in Salvador. The parties have similar structures, depending on the orixá being honored and the general layout of the house. All parties include possession in the form of a "dance" facilitated by participants with several different roles, some of which appear to be divided by gender (but only through ethnographic interviews will I be able to better understand this potential division). 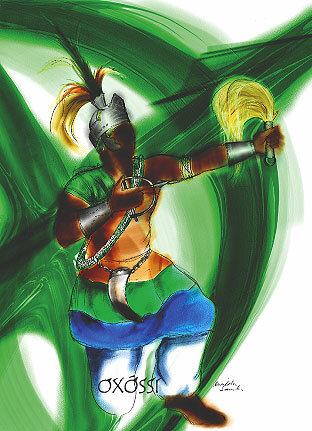 In general, men (ogãs) play the percussion which "call" the gods in yoruba chants to be incorporated by the possessed "dancers" (I use quotations as rough translations of concepts difficult to express). I was interested in the role of the ekedis, who are the women that accompany the possessed and take care of them as they scream, cry, twitch, sweat, or run towards the door. They pat their sweaty foreheads, pick up pieces of clothing as they fall on the ground, give them hugs (carinhos), and generally guide them as they are driven by the spiritual force. This role appears particularly motherly, and necessary to maintain order of the ritual. The decorations and adornments for the parties are striking. There are so many details, I could observe for years and not see (let alone understand) every intentional color, placement, object, accessory and article of clothing. Photographs are understandably prohibited, so I can only describe from a long-exposed mental picture. The color scheme and general theme are determined by the orixá being honored. The party for oxóssi, for example, focused on hunting, greenery and forestry. There were animal skins on the walls, bows-and-arrows, flowers and plants that created a fresh, green aroma. In one of the houses there was a large altar for oxóssi in the middle of the room, where the possessed would dance around in a circle. There was a painting of him-- a strong, dark warrior man with flowers all around him. The altar was encircled by old, regal wooden chairs where the possessed would take turns resting in a sort of musical chairs. I want to call the clothing "costumes" without undermining their spiritual and ritual purpose, but they certainly create a spectacle. As far as I could tell (and these assumptions are subject to change), the first round of dancing/possession is not for the honored god, but rather his/her "friends" to sort of warm up the party. The clothing is simple "baiana" dress, including long white dresses, skirts, as well as wraps/scarves, necklaces, head turbans coordinated with their god's color. In general, the possessed are women, with only a few male participants. The second round, however, is quite different. All at once a line of elaborately adorned men and women enter the room in honor of the orixá for that particular party. They use accessories associated with each orixá (for example, bows and arrows, masks, head pieces, staffs) and each is dressed specifically within the particular theme for the god. As this limited description shows, it is quite an affair. My experience in these spaces have left me with many new research questions and directions, including, what is the value of studying gender in these rituals? My real interest lies in the social life of candomblé practitioners, begging the question, do the gender roles in candomblé have an effect on greater bahian society? The structure of the religion is different with every house, tradition, "nation", so it is dangerous to make any overarching conclusions. However, any way you look at it, these introductions into the world of candomblé have been incredibly interesting and useful in diving further into the field of my research, and exposing me to an entirely different world of spirituality.